The Theatro “retail operations solution” — which uses a combination of voice-activated wearables, Wi-Fi, and indoor positioning to let employees find and connect with one another on the sales floor — bears an unmistakable resemblance to a certain sci-fi communicator badge. 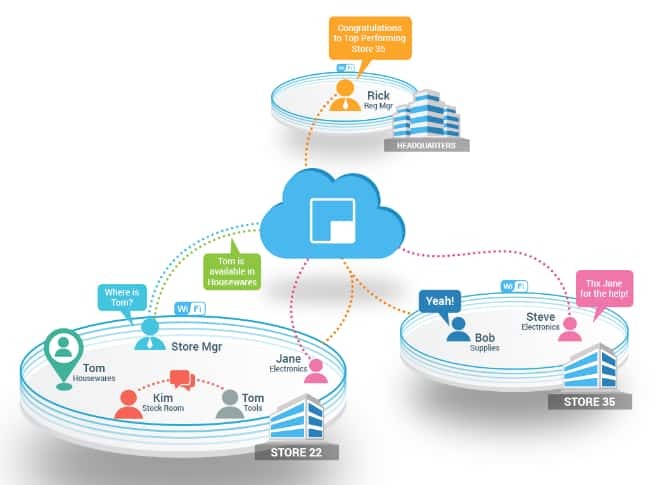 With tap- and voice-activated features to connect employees one-on-one or in preset groups, and automatic responses to queries like “Where is Alice?” and “Who is in housewares?”, Theatro’s system might as well be marketed as Store Trek. To anyone who’s worked in a large retail environment, the benefits should be obvious. Large supermarkets, big-box retailers and department stores can be crowded, noisy places where it’s hard to hear loudspeaker announcements and easy for employees to wander far from their assigned departments in the quest to help a customer. Being able to reach someone directly, or at least learn their location, would make it that much easier to meet customers’ needs, share information, and coordinate activities like restocking. Employees can tap their wearable to set an “engaged” status, which mutes all incoming messages so they can focus on a customer. There’s also a button that activates an optional “buddy system”, which pairs a newer employee with an experienced mentor for instant communication and on-the-job training without the need to constantly shadow one another. At the managerial level, Theatro provides mobile and web apps that connect supervisors to entire stores or regions to make general announcements and analyze data generated by the system. Heatmaps of indoor positioning data, for instance, can reveal under- or over-staffed areas of the store and influence scheduling decisions. Of course, there’s a danger that this kind of technology will lead some supervisors and executives further down the path of micromanagement. The ability to second-guess an employee’s every step, or to measure buzzwordy metrics like “productivity” and “customer engagement” down to the nearest millisecond, can be powerful temptations. But retail remains a fundamentally human interaction, and the value of technology like Theatro’s will best be measured by how well it helps people to communicate and co-operate. Visit Theatro.com to learn more.